Room preparation and proper wine cellar climate control systems are key to achieving and maintaining cool and stable climate conditions in a wine storage space. The standard for an optimum wine cellar environment is maintaining temperature and humidity levels within 50°F to 57°F and 60% to 70%, respectively. Wine cellar climate control Los Angeles is the core component of refrigerated wine cellars. They are engineered to regulate wine storage conditions in a wine cellar, to ensure the proper preservation of wine collectibles over time. With the right support infrastructure in place (e.g. insulation, vapor barriers, etc. ), a climate control system will reliably and efficiently cool a wine storage space. 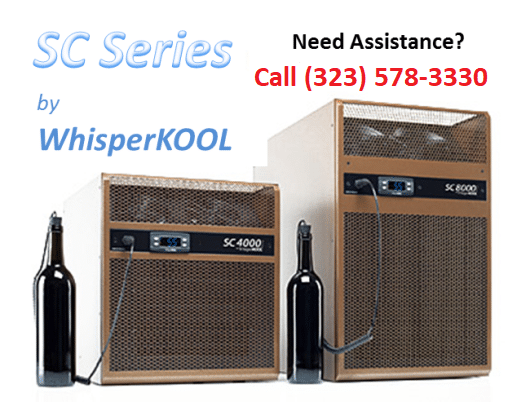 One of the most reliable brands of wine cellar cooling systems, highly recommended by most master wine cellar builders in Los Angeles, is WhisperKOOL Cooling Systems. They offer a series of wine cellar refrigeration systems that will facilitate the cooling of wine rooms up to 2,000 cubic feet. 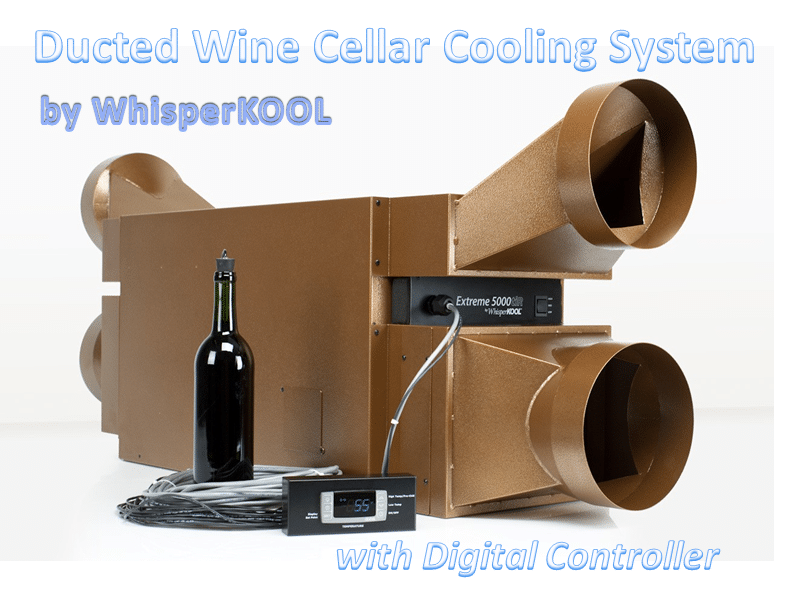 WhisperKOOL offers three types of wine cellar cooling systems: self-contained systems, split systems, and ducted systems. WhisperKOOL’s self-contained cooling systems include the evaporator unit and condensing unit. A self-contained unit is the most economical, and the easiest to install. It is designed for simple through the wall installation. One end of the self-contained cooling system supplies chilled air into the wine room, while the other end vents warm air to an adjacent room. The adjoining room must be well-ventilated and sizable enough to accommodate the heat exhausted from the cooling system. WhisperKOOL’s self-contained wine cellar climate control units are available in four models: SC Series, Slimline, InCellar and Extreme Series. The WhisperKOOL SC Series features a single piece mounting bracket that makes the installation process smooth and easy. The unit comes with a Condensate Evaporator, engineered to reduce condensation by re-using heat produced during the refrigeration process to evaporate excess moisture. Additionally, the SC Series wine cabinets cooling unit is designed with oversized coils, for efficient cooling capacity and better heat dissipation. The Slimline wine cabinets cooling system from WhisperKOOL is designed to mount into the rarely used space located between the ceiling and the entryway door, allowing for the maximum storage capacity of wine cellars. WhisperKOOL Slimline is the quietest wine cellar climate control system available. The unit has the ability to reliably cool wine rooms up to 350 cubic feet, while consuming less power. WhisperKOOL InCellar cooling systems offers an efficient way of cooling refrigerated wine cellars and exhausting warm air. The unit features a top facing exhaust that allows warm air to be ducted into the attic or outdoors. It is built with a crankcase heater that protects the compressor against refrigerant migration. InCellar is engineered to maintain ideal climate conditions in wine cellars up to 2,000 cubic feet. The Extreme Series is WhisperKOOL’s most powerful commercial grade wine cabinets cooling system. Built from state of the art, high quality parts, the WhisperKOOL Extreme is designed with a 55° temperature differential that allows the unit to provide optimum performance, even in the most extreme environmental conditions. Split wine cellar climate control is the most efficient way to maintain ideal temperature and humidity levels in refrigerated wine cellars. Condensers are the noisiest part of a cooling system, and require a large amount of space for proper ventilation. Splitting a cooling unit condenser from the evaporator promotes efficient operation and an extremely quiet storage environment. The condensing unit is located remotely (usually outdoors or inside the utility area), while the evaporator is mounted inside or near the wine cellar. 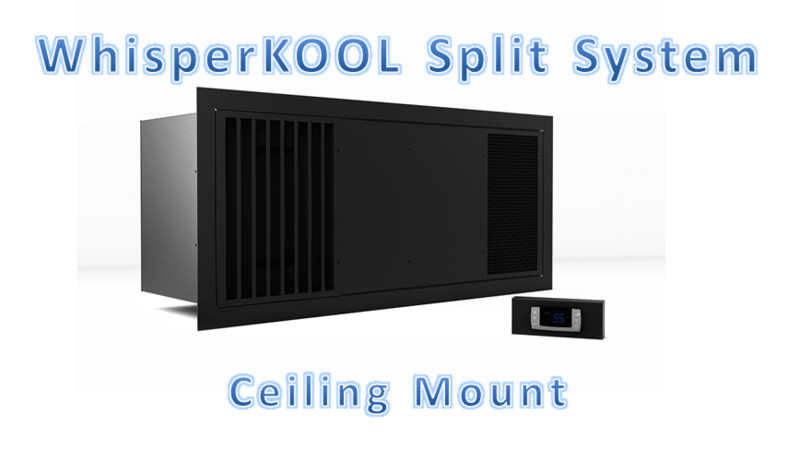 There are three types of WhisperKOOL split systems: Ceiling Mount, Mini Split and Platinum Split. As the name suggests, the Ceiling Mount split system evaporator is mounted on the ceiling. This cooling unit type not only maximizes racking capacity, but also adds to the aesthetic appeal of the space, by virtually eliminating the presence of refrigeration equipment in the wine cellar. The system pulls in warm air that accumulates at the ceiling, cools it, and then diffuses the chilled air throughout the wine cellar environment. The Ceiling Mount split system evaporator comes with a condensate pump system and optional active humidity control. The optional Active Humidity feature is designed to ascertain the amount of moisture required to maintain ideal humidity levels when humidity drops. This integrated system utilizes Intermittent Mist Technology Injection, eliminating the use of materials that can encourage mold growth, such as pads or filters. With the compressor located remotely, and the evaporator installed within the wine cellar, WhisperKOOL Platinum Mini-Split quietly and reliably cools wine rooms up to 500 cubic feet. This compact unit is designed with Advanced System Protection Technology, which utilizes monitoring probes that ensure the efficiency and peak performance of the cooling equipment. Designed to be 25% more efficient, with 10% reduction in overall noise, the Platinum Split is the quietest and most efficient wine cellar climate control system from WhisperKOOL. 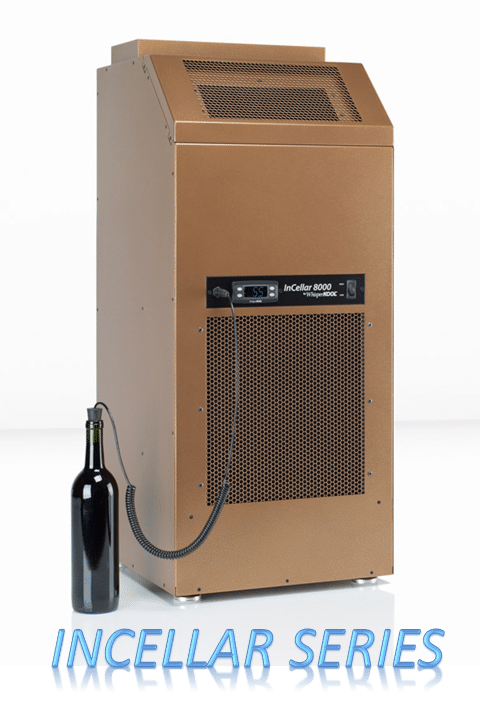 Offering maximum flexibility in installation options, the cooling unit compressor may be installed 100 line feet away from the evaporator, or the evaporator component of the cooling system may be ducted up to 25 feet away from the wine room. 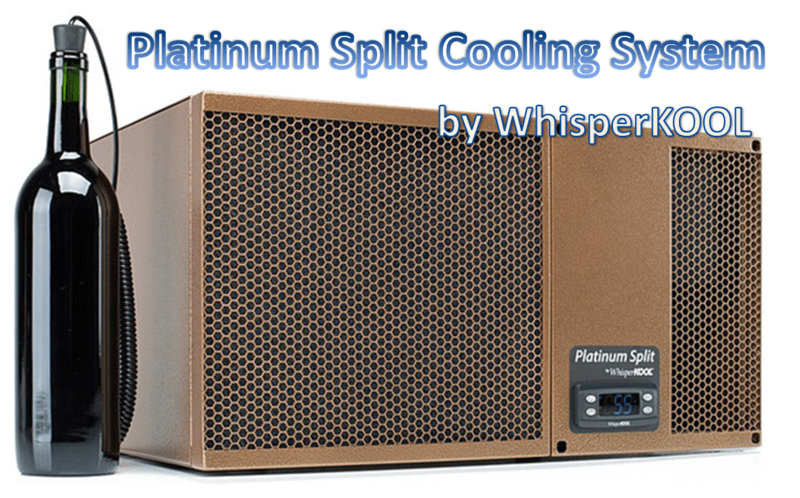 WhisperKOOL Platinum Split cooling systems are available in two models: Platinum Split 4000 (for areas up to 1,000 cubic feet) and Platinum Split 8000 (for areas up to 2,000 cubic feet). The unit has a 55° temperature differential that allow it to function efficiently, even in areas with extreme climate conditions. Fully ducted systems from WhisperKOOL promote a virtually silent wine storage environment. The cooling system evaporator can be installed up to 25 duct feet away from the wine cellar. Fully ducted systems use ductwork to circulate chilled air into the wine room and exhaust warm air to the outside of the home. All climate control systems from WhisperKOOL come with an advanced digital controller and bottle probe. The Advanced Digital Controller allows wine collectors to view wine temperature, and the evaporator coil and condensing coil temperatures. In addition, this technology offers adjustable humidity controls, alert capabilities, quick chill and anti-frost functions, and energy saving modes. A bottle probe measures actual liquid temperature within a bottle, which allows the cooling unit to function more efficiently. 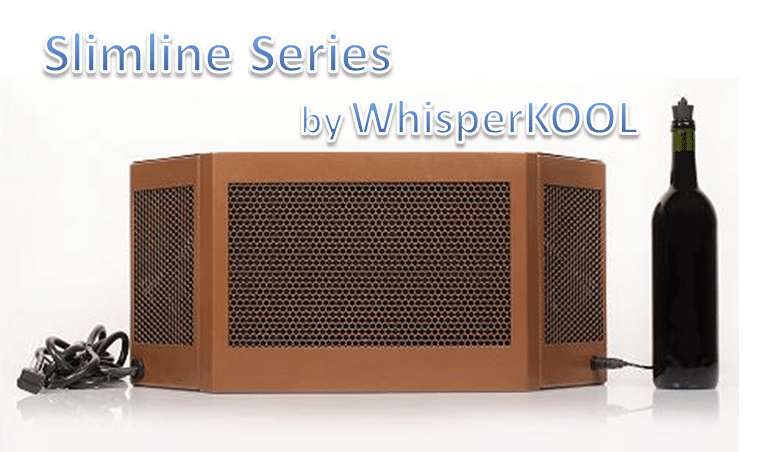 WhisperKOOL cooling systems are built with a solid, durable finish, that is resistant to fingerprints, scratches, and rust. The bronze finish of WhisperKOOL products is designed to blend well with the existing wine cellar racking. It is always recommended to consult with master wine cellar builders in Los Angeles to help determine the proper climate control system for a particular wine cellar. Master wine cellar builders perform a heat load calculation, in order to choose a refrigeration system that will reliably and efficiently cool a wine room. At M&M Wine Cellar Cooling Systems Los Angeles, we offer a line of quality wine cellar climate control systems, including WhisperKOOL. 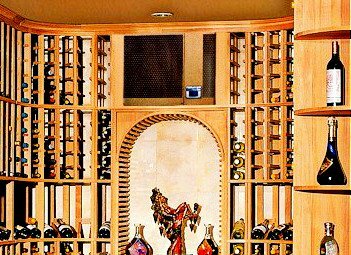 Contact M&M Wine Cellar Cooling Los Angeles for installation and maintenance services, or if you have a wine cellar construction project in mind.